As you drive away this summer remember: roads make trade marks. Britain’s first motorway opened in 1957, post-war travel was going to be for everyone. In the USA the beat generation’s story teller sprinkled some culture between the double yellow lines. The Beatnik Bible, ‘On The Road’, was published just two months before the British transport minister, Ernest Marples, baptised the M1. By 1960 a million of Sir Alec Issigonis’ Morris Minors had been sold. They brought the magic of travel to families who couldn’t afford to break the bank. And for those who could, Triumph, MG and Jaguar sports cars spread up the M1 and out into the world. The dream of speed went further. For teddy boys, rockers and mods, it was a case of four wheels bad – two wheels good. If you really wanted to cut a dash you needed to look like Marlon Brando in the Wild One or Steve McQueen in The Great Escape – that meant British bikes: a Triumph Thunderbird 6T or a Triumph TR6 Trophy. If you couldn’t afford the big machines, mods transformed scooters from dainty looking devices with a hint of food-blender styling into dangerous instruments of social change. Of course, unless you’re doing the Isle of Man TT races, in which the whole point is to go round in circles, speed isn’t much good without a destination. New roads created a new world, with its own branding and language. The first service station opened at the Watford Gap in 1957, in Reading the first Little Chef appeared the following year, created by Sam Alper the designer of the iconic Sprite caravan. Hitherto unknown fields and laybys were transformed into theatres of style, status, and self-propulsion. There is nothing particularly beautiful about the stretch of the London’s old North Circular Road between the Hanger Lane and Park Royal. When the North Circular was first constructed in the 1930s, the Ace Cafe was built here to cater for hauliers. But by the ‘50’s and ‘60’s, it wasn’t utilitarian trucks that made the Ace’s reputation. 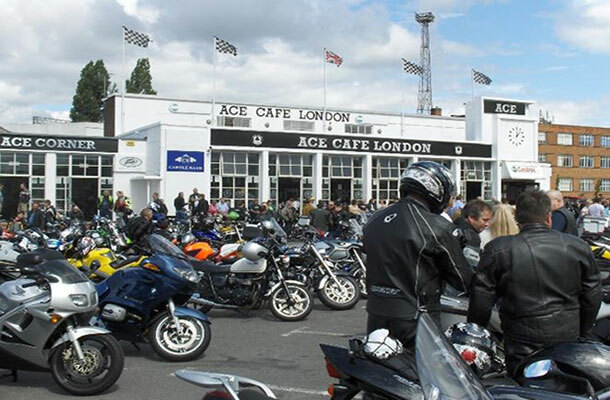 The Ace Cafe became the home of bikers, ‘Ton-Up boys’ and ‘cafe racers’. It even evolved it’s very own North London equivalent of the death-dealing Isle of Man TT circuit. The Jukebox Run meant dropping a coin, selecting a disc on the jukebox then running hell for leather for the bike, accelerating to the Hanger Lane roundabout and charging back, before the song was finished. Bohemian Rhapsody hadn’t been discovered – all singles lasted about two and half minutes. The Ace brought the allure of the road to the suburbs of London. But when the ‘60s came to an end, the Ace closed. Perhaps the highways were filling with commuters and the speed restrictions were too strong. The age of the cafe racer had passed, but the cafe itself, with its no-nonsense food-for-everyone and its inclusive ethos, was rescued, by a local boy, a motorcyclist, a mounted policeman and a believer in the democracy of the road – Mark Wilsmore. Wilsmore didn’t just save the Ace, he made it. When I wasn’t managing football crowds from a horse, I was organising destinations for my friends with motorbikes. It was one of these Ace originals, Nick Robey, who gave me my eureka moment. In 1994 Mark organised an event to celebrate 25 years since the Ace’s closure. He had contacted the motorcycle community. Sacks of mail offering help poured in, everyone wanted the Ace back. From riders who knew about marketing and the law, one piece of advice stood out. With the help of an IP professional we got our trade mark registered. I had no doubt that the Ace would be a success because the level of enthusiasm for the place was so high. 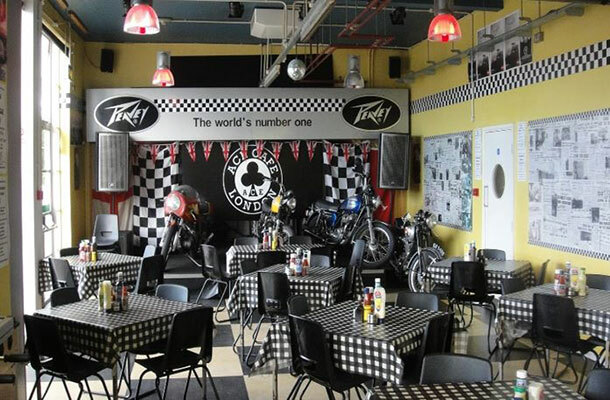 Today the Ace Cafe is Britain’s trade mark motorcycle cafe and it’s the destination point for petrol heads from all over the world. Thousands of riders and car enthusiasts visit the cafe every month. And on 4 September - the date of this year’s annual Brighton run, the event that Wilsmore first organised to give the speedsters their goal – the Ace will draw 10,000 enthusiasts back onto the road. The Ace Cafe brand is global. Branded Ace Cafes can be found in Switzerland, Finland and China, a new cafe will open in Orlando and talks are underway for cafes to be built in Russia, Spain and India. Mark is clear about the reason for his brand’s success. In his opinion, the global reach of this cafe on the North Circular is due to ‘the ethos of sharing a passion for speed’. Images © "Ace Cafe London Archive".